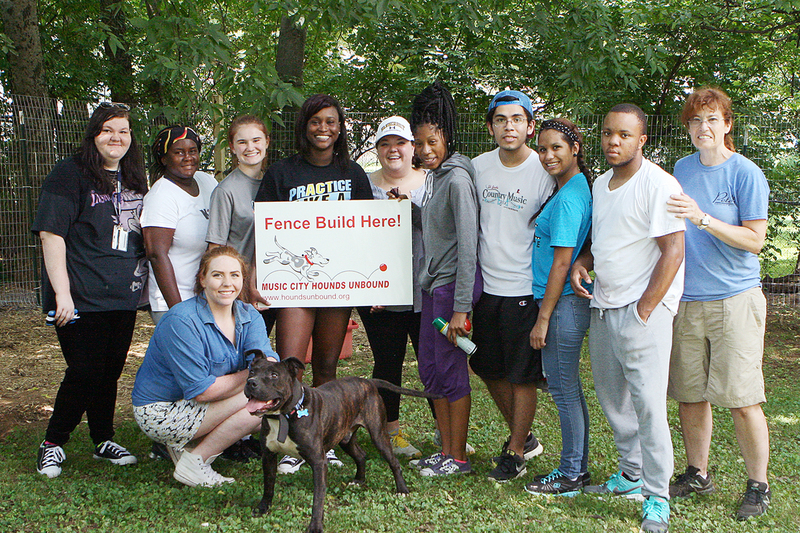 As part of their summer program at Belmont, 11 Bridges Scholars, students participating in the University’s Bridges to Belmont program, have spent their Friday afternoons volunteering in the community for Hounds Unbound program of the Neighborhood Safety and Animal Welfare Study. Added to the transitional summer orientation for the students last year, this year was the second year that volunteer opportunities have been included in the summer programming. Committed to building fences for dogs that would otherwise be chained for 24 hours a day, Hounds Unbound had the scholars build fences to allow dogs to run more freely – eliminating the aggression caused by chaining. The animals, Sam and Rio, exhibited a great change in their demeanor once the newly expanded habitats were created by the students. For more information on Hounds Unbound, click here. Header image provided by Lelia Grossman.